General Dynamics, Lockheed Martin and Northrop Grumman report quarterly results this week. These stocks have strong gains since their Dec. 26 lows, but remain in bear market territory since setting all-time highs in early 2018. General Dynamics Corp. (GD - Get Report) , Lockheed Martin Corp. (LMT - Get Report) and Northrop Grumman (NOC report quarterly results this week. These stocks have strong gains since their Dec. 26 lows, but remain in bear market territory since setting all-time highs between February and April 2018. General Dynamics closed Friday at $171.22 up 8.9% so far in 2019 but still in bear market territory 25.6% below its March 9, 2018 all-time high of $230.00. The stock is up 19% from its Dec. 26 low of $143.87. The defense company has a P/E ratio of 15.77 and offers a dividend yield of 2.17% according to Macrotrends. Analysts expect the company to earn $2.97 a share when they report earnings before the open Wednesday, Jan. 30. The consensus call is that earnings-per-share and revenue will show solid year-over-year gains. Lockheed Martin closed Friday at $287.04, up 9.6% so far in 2019, but still in bear market territory 20.9% below its Feb. 16, 2018 all-time high of $363.00. The stock is up 19% from its Dec. 26 low of $241.18. The defense contractor has a P/E ratio of 16.15 and offers a dividend yield of 3.07%. Analysts expect the company to earn $4.36 a share when they report earnings before the open Tuesday, Jan. 29. The F-35 Lightning II 5th Generation fighter with advanced stealth capabilities should be the driver in earnings guidance. Northrop Grumman closed Friday at $272.84 up 11.4% so far in 2019 but still in bear market territory 24.4% below its April 5, 2018 all-time high of $360.88. The stock is up 22% from its Dec. 26 low of $223.61. The defense contractor has a P/E ratio of 15.59 and offers a dividend yield of 1.76%. Analysts expect the company to earn $4.40 a share when they report earnings before the open on Thursday, Jan. 31. The consensus is that the aerospace-defense company will extend its string of earnings beats to 15 consecutive quarters. Shares of General Dynamics has been below a "death cross" since June 8, 2018 when the 50-day simple moving average fell below the 200-day simple moving average to indicate that lower prices would follow. 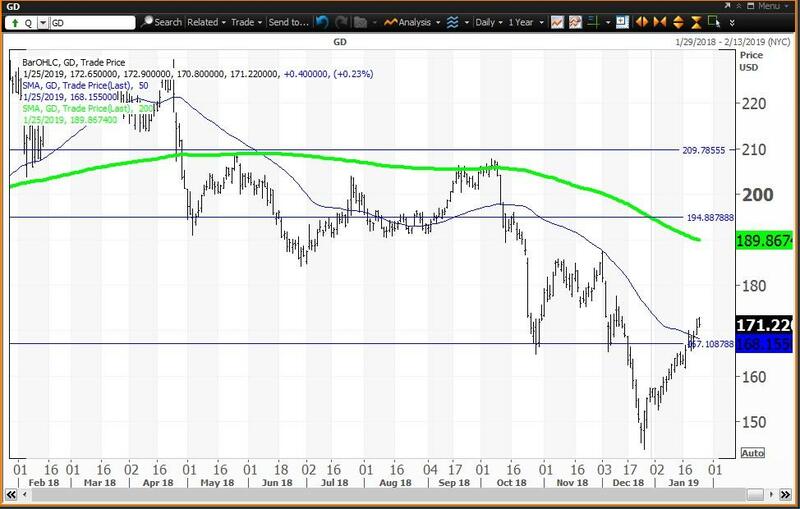 Under this bearish formation, investors should reduce holdings on strength to the 200-day SMA, which was last doable on Oct. 9 when the average was $205.77. When the stock traded as low as $143.87 on Dec. 26, that day became a "key reversal" with the close of $152.17 above the Dec. 24 high of $149.68. The Dec. 31 close of $157.21 was the input to my proprietary analytics which resulted in the three horizontals lines on the chart. My monthly pivot is $167.11 with my semiannual and annual risky levels converged as the second line at $194.23 and $194.98 and my quarterly risky level at $209.74. The weekly chart for General Dynamics is positive with the stock above its five-week modified moving average of $168.41 and just below its 200-week simple moving average or "reversion to the mean" at $172.89. The 12x3x3 weekly slow stochastic reading ended last week at 36.42 up from 27.80 on Jan. 18. 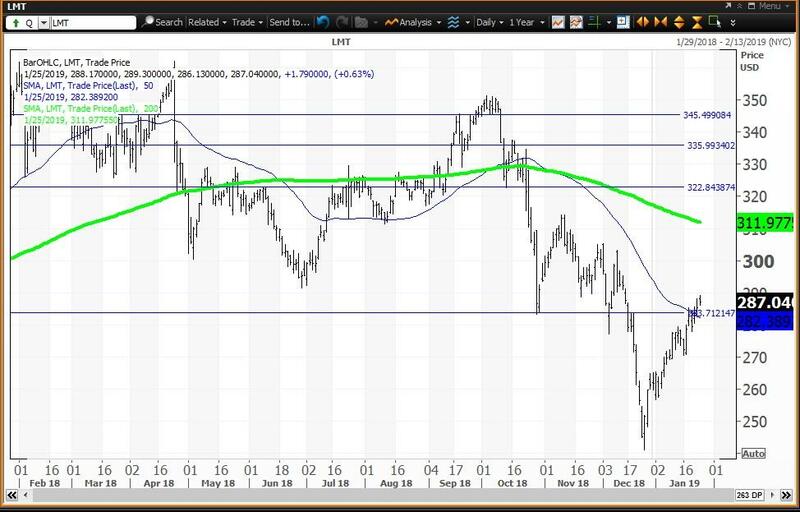 Trading Strategy: Buy weakness to my monthly value level at $167.11 and reduce holdings on strength to my semiannual and annual risky levels at $194.23 and $194.98, respectively. Shares of Lockheed Martin have been below a "death cross" since Nov. 8 when the 50-day simple moving average fell below the 200-day simple moving average to indicate that lower prices would follow. The Dec. 31 close of $261.84 was the input to my proprietary analytics, which resulted in the four horizontal lines on the chart. My monthly pivot at $283.69 held at Monday's open. My semiannual, annual and quarterly risky levels are $322.75, $336.92 and $345.52, respectively. 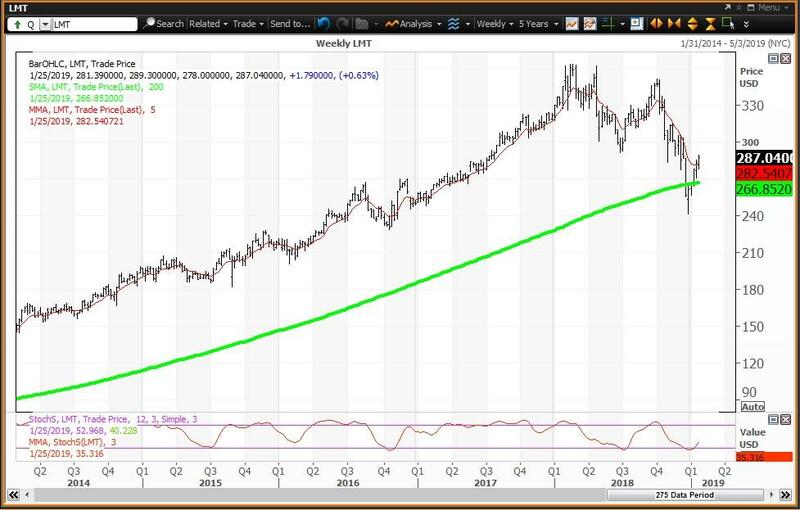 The weekly chart for Lockheed Martin is positive, with the stock above its five-week modified moving average of $283.32 and above its 200-week SMA or "reversion to the mean" at $267.29, which held as 2019 began. The 12x3x3 weekly slow stochastic reading ended last week at 35.32, up from 26.49 on Jan. 18. 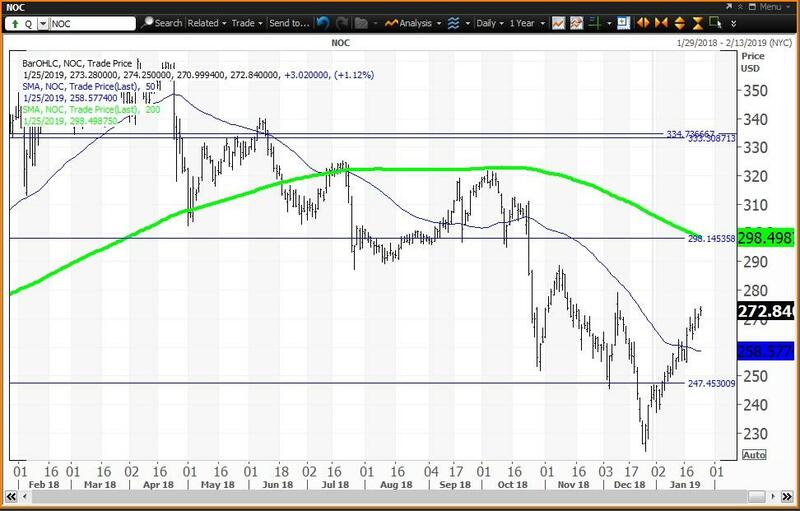 Trading Strategy: Buy this stock on weakness to my monthly value level of $283.69 and add to this position on weakness to the 200-week simple moving average or "reversion to the mean" at $267.29. Reduce holdings on strength to my semiannual, annual and quarterly risky levels at $322.75, $336.92 and $345.52, respectively. Shares of Northrop Grumman have been below a "death cross" since July 24, when the 50-day simple moving average fell below the 200-day simple moving average to indicate that lower prices would follow. The high this day was an opportunity to reduce holdings at its 200-day SMA at $322.07. The Dec. 31 close of $244.90 was the input to my proprietary analytics, which resulted in the four horizontal lines on the chart. My monthly pivot at $247.50 became a value level, which held as a buying opportunity on Jan. 7. My annual, semiannual and quarterly risky levels are $298.16, $333.37 and $334.79, respectively. 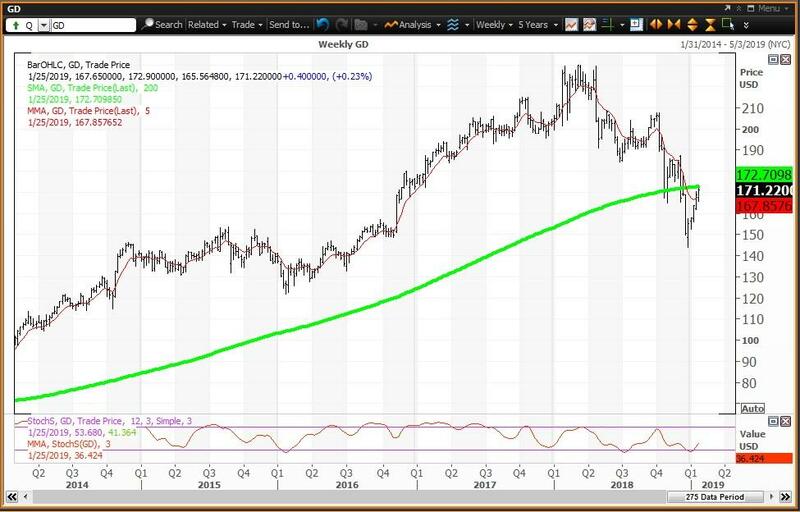 The weekly chart for Northrop Grumman is positive, with the stock above its five-week modified moving average of $264.31 and above its 200-week SMA or "reversion to the mean" at $244.91, which was crossed as a buying opportunity as 2019 began. The 12x3x3 weekly slow stochastic reading ended last week at 39.18 up from 28.63 on Jan. 18. Trading Strategy: Buy weakness to my monthly value level of $247.50 and to the 200-week SMA at $244.91. Reduce holdings on strength to my annual, semiannual and quarterly risky levels at $298.16, $333.37 and $334.79, respectively.